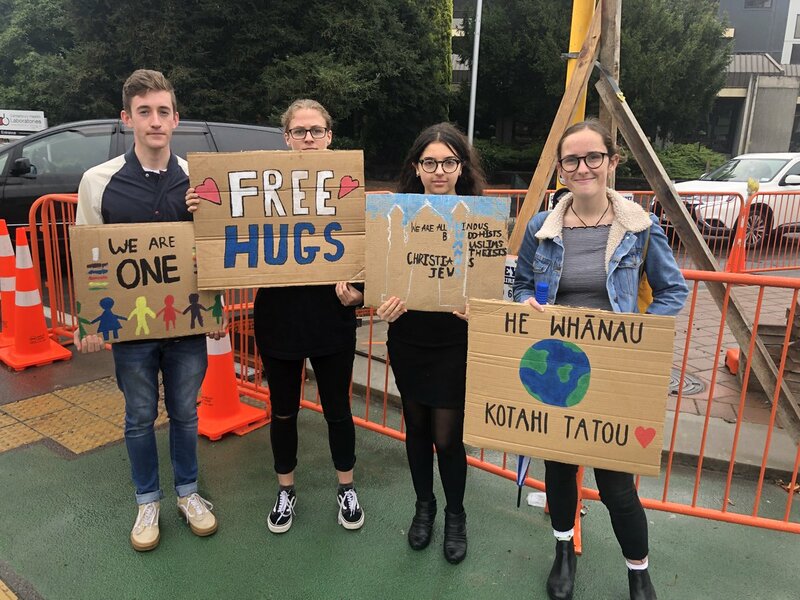 Shonny Jones, 17 is with three friends at Hagley Park, holding signs that read ‘free hugs’ and ‘we are one’. They are headed to the makeshift memorials, with flowers and cards still piling up. “Some terrible thing shave happened lately and we need to spread positivity and get it out there we can get through this and we are going to be okay,” Jones says. Police in Queensland have arrested a man after he drove his car into the gates of a mosque south of Brisbane overnight. Police allege that at 2.20pm on Saturday a 23-year-old man was stopped for a roadside drug test and was given a 24-hour driver’s licence suspension notice after he returned a positive result. But police say that once the man was released from custody, he returned to his car and drove it into the front gates of the Baitul Masroor mosque in Stockleigh, south of Brisbane. Police allege the man caused “minor damage” to the gates and “shouted offensive words through the open driver’s window towards the people inside, before driving home where he was located by police”. He was arrested and further charged with one count each of wilful damage, committing public nuisance and driving a motor vehicle while suspended. 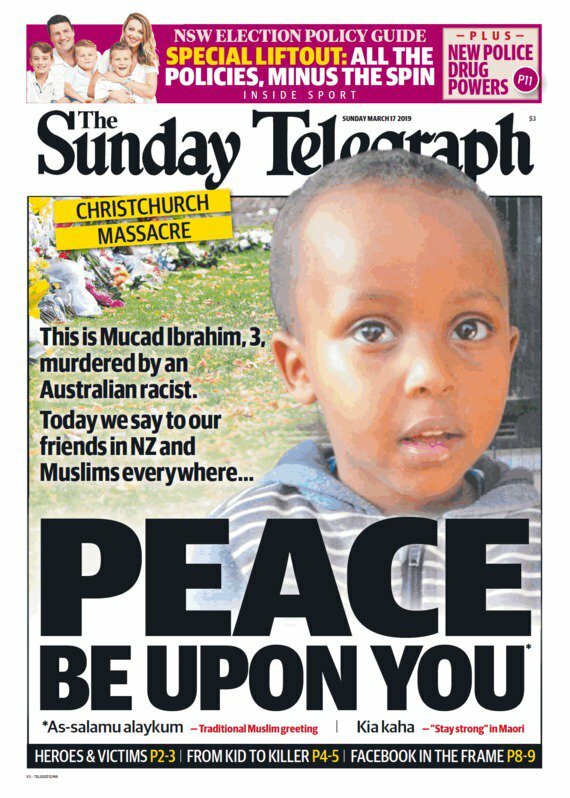 A few of the front pages from Christchurch, Australia and London today. Jacinda Ardern placed a wreath at the Kilbirnie mosque in Wellington a little while ago. 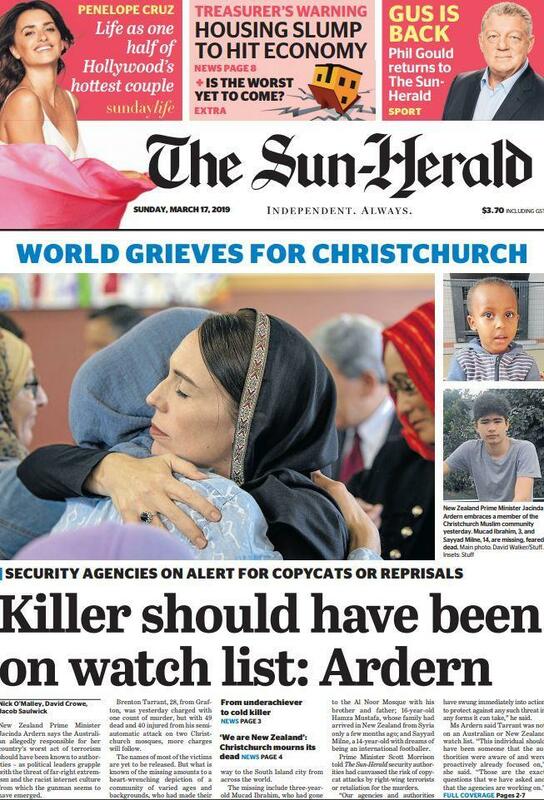 The crowd gathered at the mosque sang a Te Reo rendition of Hallelujah, per the New Zealand Herald. The prime minister embraced a crying man at the top of the steps before going inside the mosque to meet with Muslim community members. At Christchurch hospital, the founder and chair of the Canterbury Refugee Resettlement and Resource Centre, Ahmed Tani, has not slept for days. His phone won’t stop ringing and family members of the dead and injured approach him outside of the hospital for support. Tani has barely had time to grieve the loss of many of his friends. He has been too busy supporting others. While interpretation of Islamic law regarding burials varies, burying a person as soon as possible after death is a fundamental principal of Islam, usually no more than 24 hours later. But families have not been given any indication from police as to when bodies will be released to them, and their unease is mounting. He said that the prime minister, Jacinda Ardern, had eased many of the frustrations. Who was Brenton Tarrant? 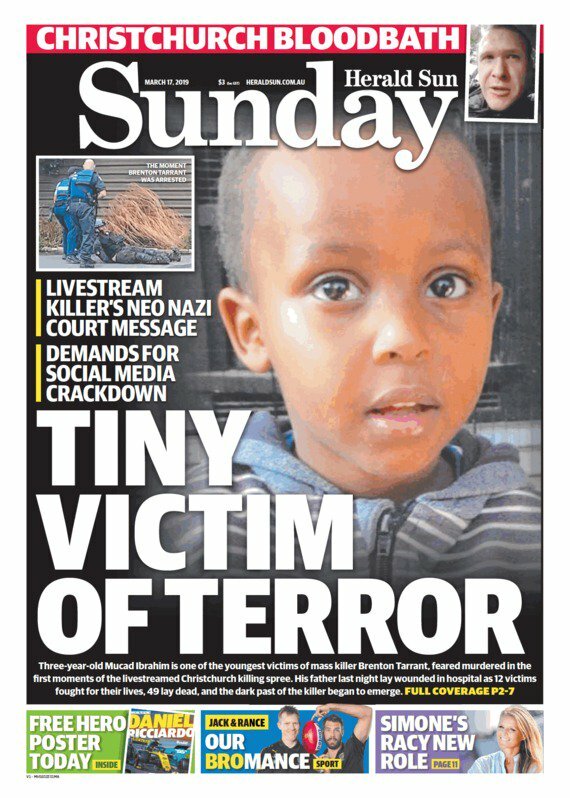 Ben Smee has filed this piece from the town of Grafton, in northern New South Wales, where the suspected gunman grew up. Few could point to little other than a normal upbringing, Ben writes. There’s an additional person who’s had further operative surgery and has come back to the intensive care unit. It’s a fairly fluid situation depending on where we think the patient is best managed. This stretches a lot of our resources. If we think they are in abetter situation or better managed in an intensive care location, that’s where they will go. Robertson is being asked about the reaction of the staff at the hospital: “horror, stunned, anger,” he says. It’s a bit challenging for people. You know, we’re all part of the community and we’re struggling with it as much as everyone else. This is not something that we expected to see in our environment. We do see gunshot wounds. We do see all these type of injuries, but, you know, 40 or 50 people in a day is more than what we should see … Most people cope with things pretty well when you’re doing things. It’s when you go home and you think about it that that’s when the issues start to declare themselves. Greg Robertson, Christchurch hospital’s head of surgery, is speaking to media now. He says another patient is expected to go home today. There are 12 patients currently in the intensive care unit in a critical condition. We are expecting some discharges from the intensive care to the surgical wards today. In addition there is the young girl in Starship hospital. Her condition is still listed as critical. He says there are two other children in the hospital in Christchurch in a stable condition. The New Zealand prime minister, Jacinda Ardern, will lay a wreath at the Kilbirnie Mosque in Wellington with the city’s mayor, Justin Lester, shortly. It will be followed by a meeting with Islamic community leaders. Ardern is also due to hold a press conference at 4pm. Hundreds of protesters held a symbolic funeral in Istanbul on Saturday to mourn the victims of the two New Zealand mosque shootings, AFP reports. The suspected gunman charged over the attack in Christchurch published a document online that Turkish media said contained specific references to Turkey. On Saturday around 500 protesters gathered outside the Hagia Sophia, which is now a museum but was once a church before being turned into a mosque during the Ottoman empire. The crowds of mainly nationalist and Islamic groups unfurled banners that read “Muslims, stand tall!” and “Muslims, unite!” and conducted a short prayer service for the victims. “Everyone is aware of the rising Islamophobia all over the world; assailants find the courage to launch such attacks because of Muslims’ timidity,” said Faruk Hanedar, one of the demonstrators. “We are here to show Muslims are able to respond to them with a smart attitude,” he added. 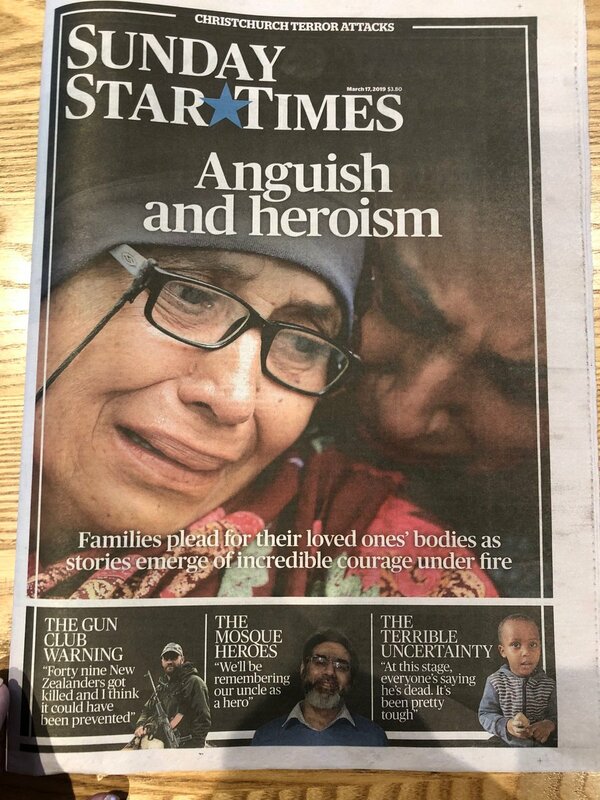 The Friday attacks on worshippers are thought to be the worst act of terror against Muslims in the West and have sparked an outpouring of grief and horror across the globe. Turkey’s president Recep Tayyip Erdogan on Friday condemned the murders, saying that hostility towards Islam was spreading in western countries “like a cancer”. “With this attack, hostility towards Islam, that the world has been idly watching and even encouraging for some time, has gone beyond individual harassment to reach the level of mass killing,” Erdogan said. This morning outside the entrance to Hagley College, police armed with rifles have implemented a “zone of respect”; stretching 100 meters either side of the college and 60 meters across. 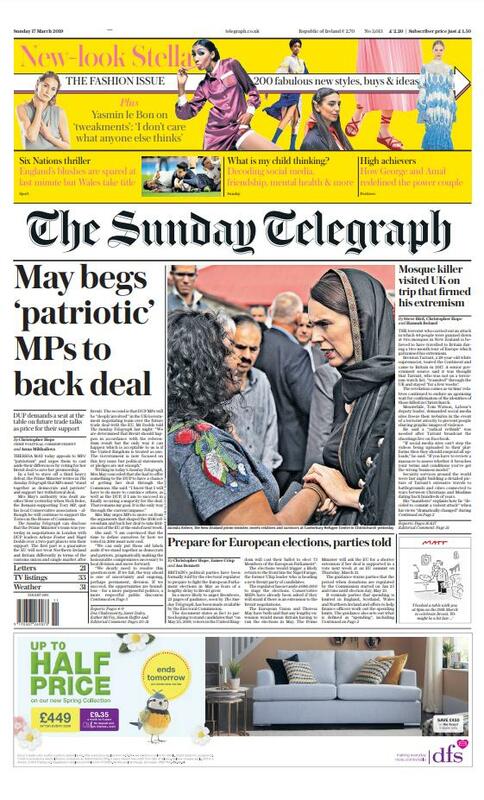 The zone or “boundary” of respect is sacred, a volunteer told the Guardian, and media and members of the public are being politely asked not to enter it, and allow the families peace and privacy, following complaints from grieving families that they were being “hounded” by the press. Young Muslim men who have flown in from other parts of New Zealand are also standing guard outside the college, their eyes downcast, their demeanour sombre. Thick red textas have been used to scrawl ‘Security’ on their fluro vests, now sodden through as the rain continues to fall.